Clinger Holsters has designed the finest Stoeger STR-9 IWB holster you’ll ever find. We call it the No Print Wonder holster. It’s incredibly small for a dual clip holster. It excels at concealment as well. The No Print Wonder holster conceals so well because of the Cling Tab system. The stiff Cling Tab works in tandem with the flexible Flex Tab. The Flex Tab hinges around your waist which allows the Cling Tab to pull your STR-9 grip in extremely close to your body. The Cling Tab system is why the No Print Wonder can conceal your handgun better than any other IWB rig you’ve tried before. The small footprint also aids in concealment. It’s a simple enough concept. Smaller Stoeger STR-9 IWB holsters are obviously easier to conceal than bulky ones. That’s why Clinger Holsters strives to ensure all our concealed carry gear is as small as absolutely possible. We design a custom molded shell for each gun model we support. 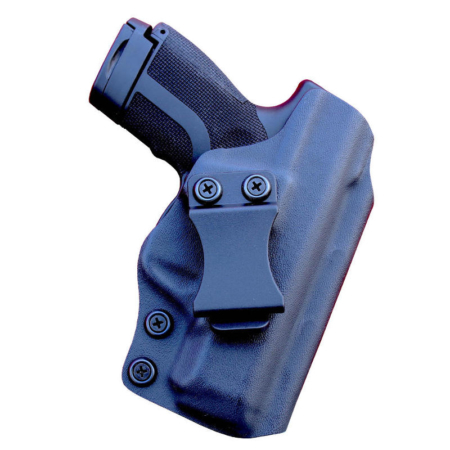 We ensure that the Kydex shell is an exact fit for your firearm. You’ll notice a click when you put your handgun into the holster. You can adjust the amount of retention in the No Print Wonder with the retention screws. It’s quick and easy to dial in the retention exactly where you want it. We ensure that the sight channel on this IWB rig is plenty tall enough to accommodate aftermarket sights. Other Stoeger STR-9 holsters don’t necessarily put as much work into the details of their concealed carry gear that we do. 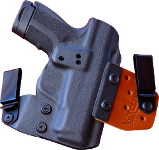 We want the No Print Wonder to be the best holster you’ve ever used. This Stoeger STR-9 IWB holster can also convert into the Ultra-Conceal OWB. That makes this a very versatile holster. All you have to do for the conversion is take the IWB belt clips off of the front of the belt tabs and install the OWB belt clips onto the back of the belt tabs. It takes just a few minutes and gives you the same functionality of owning two completely different STR-9 holsters. The No Print Wonder is ambidextrous so it can easily be reconfigured to work on the left or right side of your waist. You can also easily adjust the cant angle and ride height by moving the belt clips to the different holes in the belt tabs. The No Print Wonder can also be converted into our Stingray. It’s a single clip holster that works really well in the appendix carry position. All of our concealed carry gear is made right here in America. We’re so sure you’ll love it we offer a Two Week Buy Back Guarantee with it. This is truly the best Stoeger STR-9 IWB holster you’ve ever tried.